Oh! Oh! You just found out you have, or may have, over-contributed to your RRSP and you want to know what to do next. I empathize with you as I also over-contributed to my RRSP once. The process to fix your RRSP contribution is not quick and you will have some paperwork to diligently fill out but I can help you navigate through it. You can read through everything or jump to your question below. An RRSP over-contribution is when you (or your employer) contribute more money to your RRSP account (or spousal RRSP) than you are allowed to during the calendar year you have made the contributions. Your contribution limit is your maximum allowed contribution plus $2,000. You can find your annual limit on your notice of assessment tax statement from your previous tax year. Below is a visual graph showing an RRSP over-contribution scenario. Make sure you understand when the employer/pension contributions are reported. My employer’s matching contributions for the year 2018 are reported against the following year, 2019 in this case. It’s important to know if you over-contributed as soon as you can as the Canada Revenue Agency (CRA) will charge a 1% penalty on the over-contribution amount that you would need to pay if it’s not rectified. The calculation is not simple either and it may challenge your personal accounting. For details of the calculation, see the ‘how to calculate RRSP over-contribution’ below. One important consideration is around your RRSP benefit with your employer. You will need to have a clear understanding of when the company reports the contribution. For example, in my case, I found out that while the company makes a matching contribution during the year, the amount contributed by my employer is deducted in the following year and shows up as pension adjustment as seen below in the notice of assessment example. When you receive the notice of assessment after filing your taxes, the government provides you with your RRSP deduction limit for the next calendar year which is the lesser of 18% of your annual earned income or the annual contribution maximum set by the government for that tax year. There are 2 minus and 1 plus line that can change the final amount as outlined in the image below. 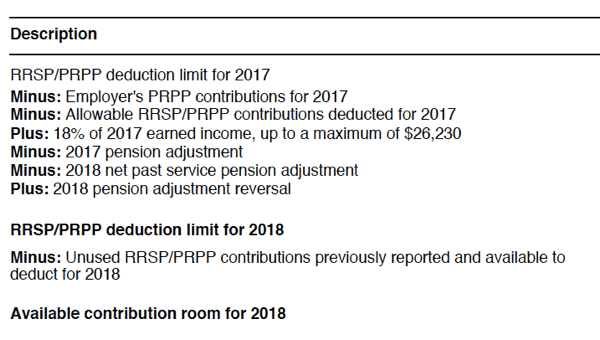 The employer contribution mentioned earlier is entered in the 2017 pension adjustment line below and you can see it uses 2017 for a future calculation in 2018. That means your employer is contributing money in 2017 and adjusting your RRSP deduction limit for the following year. If you have a CRA My Account, you can also log on the site to see your recent statements. You can authenticate using your bank authorization for simplicity through the partner login. Unfortunately, while you are doing well maximizing your RRSP contributions, there are penalties for going too far. If you are within the $2,000 limit, you probably don’t have to worry but otherwise, you are faced with 2 potential penalties. You may be able to avoid paying any penalties if you can show the CRA the steps you have taken to correct the over-contribution (more on this below) and that it was a reasonable error. It’s always good to reach out to CRA and explain the situation with your documents in hand. With pension and company plans, it can get complicated so don’t hesitate to reach out to the CRA or involved a tax accountant but first make sure you have the information on hand to avoid wasting time on the phone. There is no magic to resolve an RRSP over-contribution, you have to correct the situation and follow up with Canada Revenue Agency. The consequence, as mentioned above, is a 1% tax penalty on the over-contributed amount as well as a late-filing penalty if not corrected in the first 90 days of the calendar year – think the last day of March. There are 3 steps to follow to correct your situation but if you realize that you over-contributed before the calendar year is over, what you have to do is withdraw the amount you over-contributed as soon as you can. You will have to fill out a form with your financial institutions to withdraw from your RRSP and you will be charged a withholding tax upon the withdrawal. Box 30 in the T4RSP form would have the tax paid on withdrawal when all is said and done for your tax return. To avoid the withholding tax, you will have to fill out the T3012A CRA form and provide details of your over-contribution situation. The financial institution will need the form to return the complete amount without any amount withheld. Box 20 in the T4RP form would have the amount to file your taxes. Once you have step 1 & 2 completed, take a moment to call the Canada Revenue Agency to review your documents and the final steps. Check in with them to ensure all is in order. Make note of the person you are talking to and document your conversation with the CRA. You first need to identify the year you made the RRSP over-contribution and get all of your RRSP contribution records for that year and all the subsequent years. The records should also include your employer’s contribution or your pension. You should gather all of the information in order to calculate your contributions month by month. If you need your paycheque or your financial statement by month, you should retrieve those. Step 2 will require monthly data for the calculation. Gather your notice of assessment to have a clear understanding of your RRSP deduction limit. You will have either received it by mail or delivered through CRA’s My Account. After this step, you will have the records for all the money you contributed and the deduction limits. You can better calculate the RRSP contributions (green rectangle) against the deduction limits (orange rectangle) per year – see graph below. This is the most crucial and hardest step as your annual contributions will not match how you submitted your taxes. The first 60 days of contributions we are allowed to include needs to be excluded from the year it’s reported on your taxes and included in the following year. It means that your 2017 taxes probably include the first 60 days for 2018. You then need to identify the month where you crossed the threshold as that is when the penalty starts. The penalty is 1% of the over-contributed amount for the year. Below is the picture we are trying to build. The T1-OVP CRA form needs to be filled to assess the 1% penalty and make payment. To make filling out the form simpler, I have a spreadsheet that can help you with all the math. The form is set up to track the over-contribution per month as seen in the graph above. Each situation is different but the concept is the same, if you find out within the year, withdraw the money ASAP and reach out to the CRA, explain your situation and they will help you out with the proper steps. Filling out the T3012A form will be the best option to get all of your money back with the least amount of paperwork before requesting the funds to be withdrawn from your financial institution. If you find out after the calendar year is over, you have 90 days to file the T1-OVP form and correct the situation. You do not have to withdraw money as the year is complete. You will have to pay the 1% penalty on the over-contribution amount and submit the form. However, you do need to ensure the following year is not in danger of over-contribution either. The excess contribution you made is now rolling over to the new year and you may need to reduce your contribution for the year. If it’s a new year but you don’t expect an income to cover the excess contribution, you will need to withdraw and pay the penalty. That’s the worst-case scenario. There is one way to reduce the penalty for the year if you have leveraged the Home Buyer’s Plan (HBP) to purchase your home and still have money to pay back into the plan. Part of your RRSP contribution can be designated to the HBP plan and in doing so, it reduces your RRSP contribution which can prevent you from over-contributing in the end. Pay the tax within 90 days after the calendar year and avoid late-filing penalties or interest charged.